Enjoy unprecedented control over your home entertainment system, appliances, HVAC system, home security system, water heater, and garage door — all from a single remote. Other universal remotes have a blind spot — the remote itself. MOAR’s unique tri-mote™ design allows control of the remote WITH THE REMOTE! It’s the world’s first remote controlled remote control. 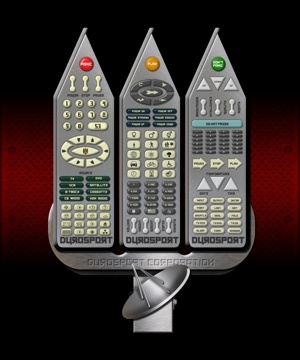 Finally, a social universal remote! MOAR’s sharing technology allows you to share control with “friends.” Just point the remote at anyone within a 50 meter radius and press the patent-pending Tendril-Attached Self-Ejecting Remote trigger. Unique tri-mote™ design includes three full-function remotes. Use each separately or combine them for simultaneous multi-device control. 148 buttons. With programmable macro combinations MOAR holds 21,904 unique IR codes. Integrated satellite dish. Extends controller range to 25 miles (line of sight required for maximum performance). 220 V adapter included (AC power required for TASER and Social features. AC power is recommended when watching movies longer than 60 minutes). Certified nuclear reactor control device (dongle sold separately). 2 hour with satellite dish enabled. 1 hour when viewing movies (please pause movie before changing batteries).